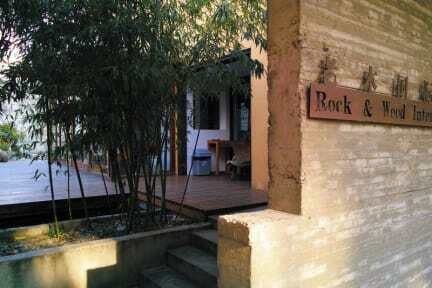 Rock&Wood International Youth Hostel is located near metro line 3 at West Yan'an Road station, connecting visitors to the rest of central Shanghai. This hostel has been with Hostelworld since they opened in 2011, offering beds which our guests say are 'nice, big and clean'. The dorms are praised for having 'comfy beds, individual lights, power outlets and shelves', while the large common area 'is always extremely social and very easy to meet people' in. Location is good. They have a bar and they do food as well from western to your rice and curry. Lockers are provided and washing is available for a cost. Nice atmosphere. Only downside is wifi. Wifi sometimes doesn't connect or is slow but maybe it was just my device. Good^ nice and clean for cheap price! Keep going, pals! Facilities are clean enough that I have no gripe about them. I like its spacious yet cozy common area, but keep in mind that you can't bring food from outside because the hostel runs its own bar there. The location may not be ideal for most tourists because it is located in the residential area and takes 13-15 minutes to walk from the metro station. Still, metro line 2 takes you to the airport(s) and the city centre without transfer, which is definitely a plus. Staff was fantastic! Room could’ve been cleaner, the floors were a bit dirty and the trash can wasn’t emptied when I arrived. The hostel was a good choice for what we needed. Good location and cute decor outside. However, it’s not very clean. I had cookie crumbs under my pillow (?!) and there were lumps of something black in the bathroom. 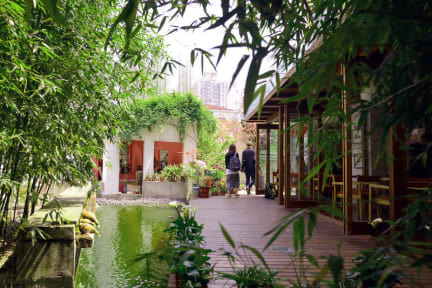 We're located about 10 minutes' walk from Zhongshan Park and only a minute from the local food market. I like to point out great local restaurants to our guests and I also recommend that people visit the French Concession. I think what puts us ahead of other hostels in Shanghai is that we offer very good services, like helping guests to book tickets for the bus and train and for acrobatic performance.